The show Sama Sama will be premiered globally on November 19th in Madrid, at Madrid Arena concert hall. As civil society committed to justice and respect for human rights and after trying to contact the managers and promoters of the show in our city with no response from their side, we have decided to publicly launch a campaign to boycott Sama Sama. 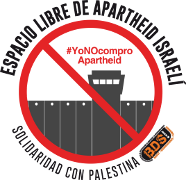 The campaign is aligned with the Boycott, Divestment and Sanctions Campaign (BDS) launched from the Palestinian civil society in 2005. Indeed, Sama Sama´s members have never experienced anything like this. Sama Sama refers to its meaning in Tagalog, the Filipino language, and means “together”. The show was created by Roi Ofer, one of the founders of Mayumana and it is formed by almost all the very same members. 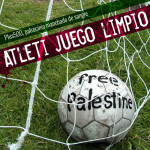 This show helps to normalize the situation in Israel and shows it as a cosmopolitan, multicultural and modern country. Unfortunately, this is far from true. In the city of Jaffa, where Mayumanas headquarters are located, there are around 15,000 Palestinians fighting poverty and colonization of their native lands. The Jaffa Popular Committee for the Defense of the Rights to Land and Housing, created in 2007 to fight the confiscation and demolition of Palestinian homes in Jaffa, estimates that there are currently more than 500 families facing demolition orders to their homes. 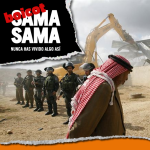 We wonder why Sama Sama uses the term “together” pretending to be a multicultural movement while they are obviating the Palestinian population living along them and the and the situation of military occupation and violation of human rights that is taking place just few kilometers away. Art is not always harmless. Sama Sama, the show, was launched during the summer of 2012 in the Municipal Museum of Art in Tel Aviv, whose president is the current mayor of the same city, Ron Huldai. Before actively participate in the Israeli politics, Huldai served at the Israel Air Force (IAF) for 26 years (1964-1989) as a fighter pilot and played key roles as high commander. We must not forget that the current mayor Huldai worked for the IAF while the Six-Day War was fought, in 1967, when Israel illegally occupied the West Bank, East Jerusalem, Gaza and the Syrian Golan Heights. All these territories, as we know, are until now subject to a military occupation and apartheid policies which are contrary to the international law. The director and founder of Sama Sama, Roi Ofer and its artistic director Amir Schorr, were also part of Mayumana, company symbol of the cultural brand of Israel abroad. Sama Sama has organized events many other times with the support and cooperation of the Government of Israel and its institutions, such as the performance held in the city of Tel Aviv in 2012 or its participation in the project to promote domestic tourism in the same council. Tel Aviv City Council promotes and participates in the policies of apartheid and ethnic cleansing of the Palestinian population living in this city. In 2010 it granted the license for the company Be’emunah, known for building houses for religious Zionist population They built a Jewish-only residential at the Palestinian neighborhood of Ajami in Jaffa. 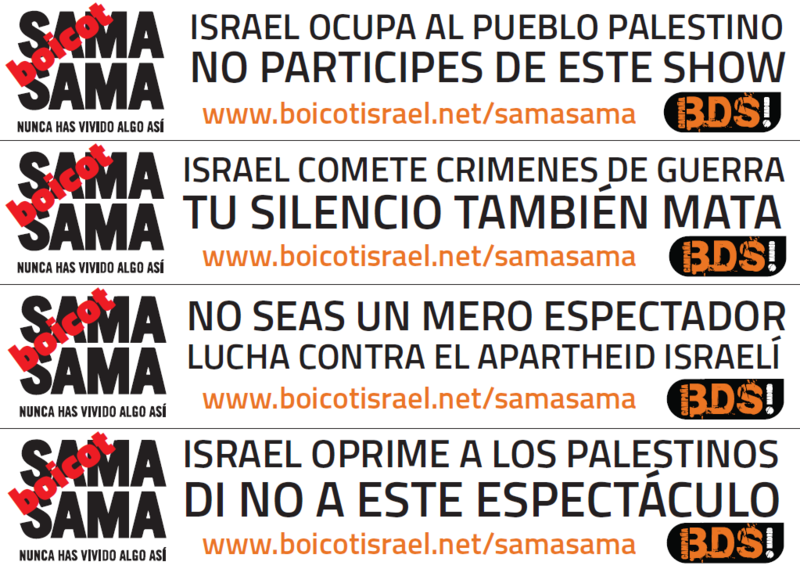 Sama Sama´s collaboration with the City Council of Tel Aviv and their silence about their crimes makes them accomplice of them. characters to Israel in order to, indirectly or directly, make up their situation as occupier, hiding, minimizing and justifying serious and illegal violations of international law. The former director of the Israeli Deputy Foreign Ministry, Nissim Ben Shitrit, stated publicly in a newspaper “We see culture and Hasbara (name given to the Israeli propaganda) as a propaganda tool of the first order, we do not differentiate culture from propaganda”. 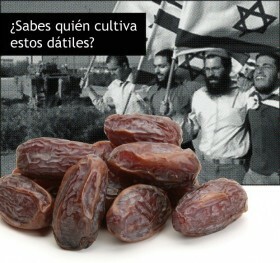 We were not surprised thus to find at website of the Embassy of Israel the premiere of Sama Sama at its calendar of events. 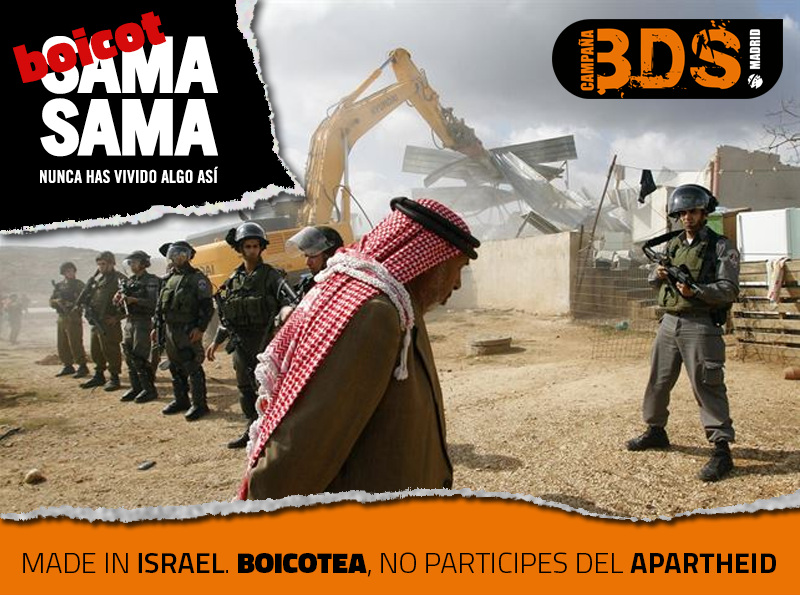 For all this, we are launching this call for justice and human rights and we ask you not to participate in Sama Sama´s shows, to share the campaign among your friends, and to say loud and clear that you are not taking part in promoting the Zionist state of Israel through their culture; to say that you don’t want to be accomplices to its crimes. 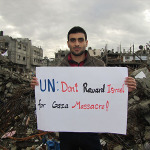 Because no one should live something like this, BOYCOTT SAMA SAMA, BOYCOTT ISRAEL.